WEST LAFAYETTE, Ind. 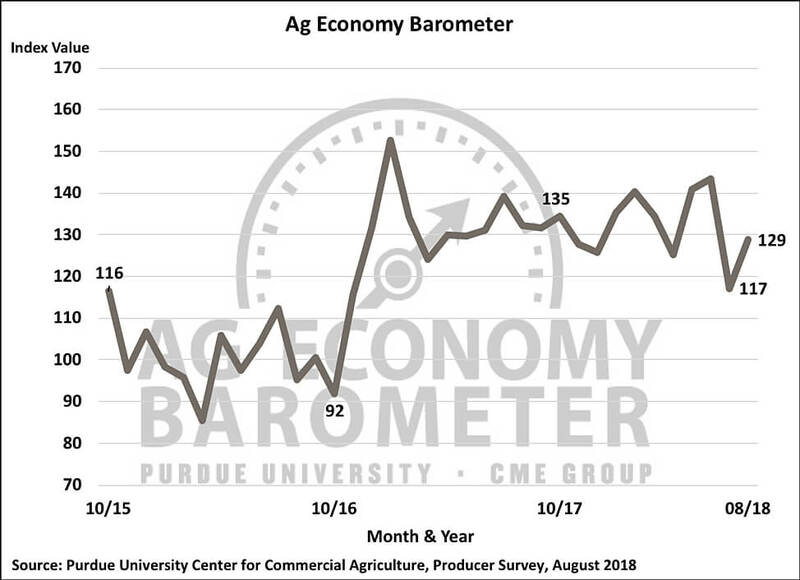 and CHICAGO, Sept. 4, 2018 /PRNewswire/ -- Agricultural producer sentiment increased modestly in August after dipping sharply in July according to the latest Purdue University/CME Group Ag Economy Barometer reading. The barometer, which is based on a monthly survey of 400 agricultural producers from across the country, had an August reading of 129, 12 points higher than July but still well below readings from May and June. "Farmer sentiment has improved over the past month, but producers are uncertain about the aid package's ability to offset income losses on their farm," said James Mintert, the barometer's principal investigator and director of Purdue University's Center for Commercial Agriculture. The uptick in this month's barometer derived largely from producers' improved perception of the current situation as the Index of Current Conditions rose to 121 from 99 in July. The Index of Future Expectations also rose, but the increase was to 132, just 6 points above its July reading. Before the August survey was conducted, the USDA announced intentions to provide aid to farmers impacted by importers' tariffs. When asked specifically about the relief plan's expected impact, farmers were split on whether they believed the plan addressed concerns about tariffs' impact on their farm's income with 47 percent saying "not at all" and a total of 47 percent saying either "completely" (4 percent) or "somewhat" (43 percent). In August, producers were again asked how likely they thought it was that a trade war would reduce their farm's net income. While 71 percent (virtually unchanged from July) felt their farm income will be negatively impacted, respondents who expect to see an income reduction of 20 percent or more fell from 35 percent in July to 26 percent on the August survey. "Farmers are still concerned trade conflicts will reduce their farm's income, but some farmers clearly scaled back the magnitude of losses they expect compared to what they told us in July," said Mintert. This less pessimistic view also impacted producers' expectations for the future of U.S. agriculture. In August, there was a small increase in respondents expecting good times in agriculture in the year ahead, rising to 22 percent from 19 percent in July. The improvement was reinforced by a significant downturn in those expecting bad times, which fell to 52 percent in August versus 61 percent in July. Similar readings occurred for attitudes on whether it was a good time to make large farm investments, which improved to 26 percent in August compared to 20 percent in July. Read the full August Ag Economy Barometer report at http://purdue.edu/agbarometer. This month's report includes producer's responses to questions about how much of their 2018 soybean crop was priced prior to the downturn in prices and their farmland price outlook. Additional August barometer analysis can also be found in a video from Center for Commercial Agriculture Director James Mintert at https://youtu.be/SVyoLpBDd4s.